Fast, flexible information sharing. It’s what the bizhub 283 laser multifunction printer was designed for. 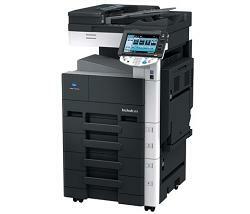 Enjoy high-volume productivity with B&W print/copy output up to 28 ppm, color and B&W scanning at up to 70 opm. The bizhub moves information fast with multiple "scan and send" and high-speed fax options. Center-office styling complemented by an 8.5" color touch-screen makes this laser multifunction printer as attractive as it is easy-to-use. Add an i-Option™ kit and you’ll be putting an unparalleled amount of power right in the hub of your office.